Description: Don't get yourself noticed and you won't get yourself hanged. In the faery slums of Bath, Bartholomew Kettle and his sister Hettie live by these words. Bartholomew and Hettie are changelings--Peculiars--and neither faeries nor humans want anything to do with them. 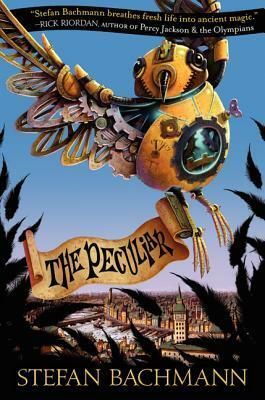 Mini Book Review: Delightfully twisted & morbid fairy tale mixed with an almost steampunk vibe. Was flabbergasted that this was written when the author was only 16. Seriously, I could barely get my homework done at that age, let alone write such a brilliant tale. I was hooked in from the opening paragraph of this story with its vivid imagery and eccentric characters. The story does drag a wee bit about a third of the way through the story but it does pick up quickly. Lots of fascinating characters and an intriguing storyline that will keep you hooked to the end of the tale. Love to see characters (Mr Jelliby) who are ordinary and relatively wimpy, do extraordinary and brave things. The ending almost killed me though with its cliffhanger especially since I have no idea how long it will be till the next story comes out. Hope this makes sense, I am home sick, and even less articulate than normal. Highly recommend this for the middle grade reader who is a little more sophisticated in his reading tastes. Glad to find someone else who enjoyed this title. I really don't think it's getting the attention it deserves! Perfect place to settle down. I would call you for more details.